Toward a New Common School Movement is a bold and urgent call to action.The authors argue that corporate school reform in the United States represents a failed project subverted by profiteering, corruption, and educational inequalities.Toward a New Common School Movement suggests that educational privatization and austerity are not simply bad policies but represent a broader redistribution of control over social life-that is, the enclosure of the global commons. This condition requires far more than a liberal defense of public schooling. It requires recovering elements of the radical progressive educational tradition while generating a new language of the common suitable to the unique challenges of the global era. 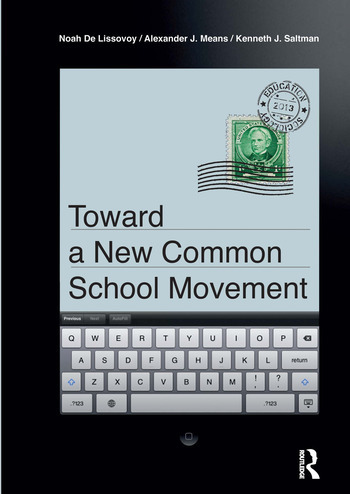 Toward a New Common School Movement traces the history of struggles over public schooling in the United States and provides a set of ethical principles for enacting the commons in educational policy, finance, labor, curriculum, and pedagogy. Ultimately, it argues for global educational struggles in common for a just and sustainable future beyond the crises of neoliberalism and predatory capitalism. Noah De Lissovoy is Assistant Professor of Cultural Studies in Education at the University of Texas Austin. He is the author of Power, Crisis, and Education for Liberation: Rethinking Critical Pedagogy, which won the Critics Choice Award from the American Educational Studies Association. Alexander J. Means is Assistant Professor in the Department of Social and Psychological Foundations of Education at SUNY Buffalo State College. He is the author of Schooling in the Age of Austerity: Urban Education and the Struggle for Democratic Life. Kenneth J. Saltman teaches at the University of Massachusetts at Dartmouth. He is the author most recently of The Gift of Education: Venture Philanthropy and Public Education (Palgrave Macmillan 2010), which was awarded a 2011 American Educational Studies Critics Choice Book Award, The Failure of Corporate School Reform (Paradigm Publishers 2012),Capitalizing on Disaster: Taking and Breaking Public Schools (Paradigm Publishers 2007), which was awarded a 2008 American Educational Studies Critics Choice Book Award, and The Edison Schools (Routledge 2005). His recent edited collections include Education as Enforcement: the Militarization and Corporatization of Schools 2nd Edition, with David Gabbard (Routledge 2010), Schooling and the Politics of Disaster (Routledge 2007), and The Critical Middle School Reader, with Enora Brown (Routledge 2005). He received a Fulbright Scholarship in 2006 on Globalization and Culture and is a fellow of the National Education Policy Center.